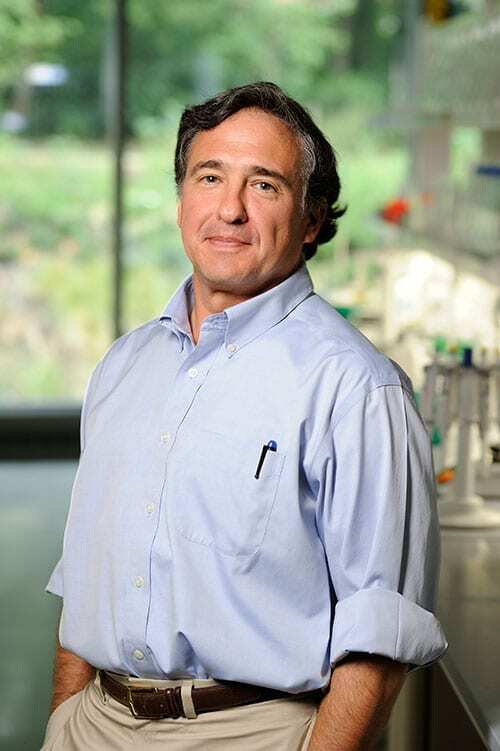 Bertrand García-Moreno is a Professor of Biophysics and of Biology in the Krieger School of Arts and Sciences, and Chair of the Thomas C. Jenkins Department of Biophysics. He received his AB in Biochemistry from Bowdoin College and his PhD in Chemistry under Frank Gurd’s supervision at Indiana University, Bloomington. He completed postdoctoral training with Gary Ackers in the Department of Biology at Johns Hopkins and in the Department of Biochemistry and Molecular Biophysics at the Washington University School of Medicine in St. Louis. His research group studies biothermodynamics and several problems in structure-function relationships of proteins using a variety of experimental and computational approaches. One of the most useful ways to correlate the structure and the function of proteins involves understanding the structural basis of electrostatic effects. To this end we study structural and molecular determinants of electrostatic interactions in proteins. The approach involves computational methods (structure-based calculations of pKa values and electrostatic energies), and structural and equilibrium thermodynamic methods to measure pKa values of ionizable groups (e.g. using NMR spectroscopy) and pH effects on structural and physical properties. Our ultimate goal is to develop computational algorithms for accurate structure-based calculation of electrostatic effects. Ionizable groups buried in dehydrated or hydrophobic protein environments constitute the structural motif common to all forms of biological energy transduction (e.g. catalysis, redox reactions, and H+ and e- transfer reactions). We study the highly anomalous properties of buried ionizable groups and the structural and thermodynamic consequences of their ionization using X-ray crystallography and NMR spectroscopy, and equilibrium thermodynamic methods for measurement of protein stability. The recent discovery of thousands of exoplanets and the accumulating evidence that life originated in black smokers in the deepest points of the ocean warrant improved understanding of life under extreme conditions of temperature, pressure, pH and ionic strength. Our goal is to outline the molecular limits of life. Because all living systems depend on proton coupled-electron transfer reactions to survive, we are focused at present in understanding the pressure, temperature, and salt dependence of pH effects in proteins. At present we are studying structural and physical consequences of cavities in proteins, of interest because volume is the conjugate variable of pressure. The approach uses X-ray crystallography, NMR spectroscopy, equilibrium thermodynamic experiments, and MD simulations. C. A. Fitch, G. Platzer, M. Okon, B. Garcia-Moreno E., and L. P. McIntosh (2015) Arginine: its pKa value revisited Protein Science 24: 752-761. J. E. Nielsen, M. R. Gunner, & B. García-Moreno E. (2011) The pKa Cooperative: A collaborative effort to advance structure-based calculations of pKa values and electrostatic effects in proteins. Proteins: Struct. Funct. Bioinf. 79: 3249-3259. C. A. Castañeda, C. A. Fitch, A. Majumdar, J. L. Schlessman, V. Khangulov & B. García-Moreno E. (2009) Molecular Determinants of the pKa Values of Asp and Glu Residues in Staphylococcal Nuclease Prot. Struct. Func. Bioinf. 77:570-588. S. T. Whitten, B. García-Moreno E., and V. J. Hilser (2005) Local conformational fluctuations can modulate the coupling between proton binding and global structural transitions in proteins Proc. Natl. Acad Sci. USA 102: 4282-4287. A. C. Robinson, C. A. Castañeda, J. L. Schlessman and B. García-Moreno E. (2014) Structural and thermodynamic consequences of burial of an artificial ion pair in the hydrophobic interior of a protein Proc. Natl. Acad. Sci. USA 111: 11685-11690. D. G. Isom, C. A. Castañeda, B. R. Cannon & B. García-Moreno E. (2011) Large Shifts in pKa Values of Lysine Residues Buried Inside a Protein. Proc. Natl. Acad. Sci. USA 108: 5260-5265. J. L. Schlessman, C. Abe, A. Gittis, D. A. Karp, M. A. Dolan & B. García-Moreno E. (2008) Crystallographic Study of Hydration of an Internal Cavity in Engineered proteins with Buried Polar or Ionizable Groups. Biophys. J. 94: 3208-3216. D. E. Richman, A. Majumdar, and B. Garcia-Moreno E. (2015) Conformational reorganization coupled to the ionization of Lys residues in proteins Biochemistry 54: 5888-5897. D. E. Richman, A. Majumdar, and B. García-Moreno E. (2014) pH dependence of conformational fluctuations of the protein backbone Proteins: Struct. Funct. Bioinf. 82: 3132-3143. M. S. Chimenti, V. S., Khangulov, A. C. Robinson, A. Heroux, A. Majumdar, J. L. Schlessman, & García-Moreno E. B. (2012) Structural reorganization triggered by charging of Lys residues in the hydrophobic interior of a protein. Structure 20: 1-15. P. Bell-Upp, A. C. Robinson, S. Whitten, E. L. Wheeler, J. Lin, W. E. Stites & B. García-Moreno E. (2011) Thermodynamic Principles for the Engineering of pH-driven Conformational Switches and Acid Insensitive Proteins. Biophys. J. 159: 217-226. M. Dellarole, J. A. Caro, J. Roche, M. Fossat, P. Barthe, B. Garcia-Moreno E., C. A. Royer and C. Roumestand (2015) Evolutionarily conserved pattern of interactions in a protein revealed by local thermal expansion properties J. Am. Chem. Soc. 137: 9354-9362. J. Roche, J. A. Caro, M. Dellarole, E. Guca, C. A. Royer, B. García-Moreno E., A. E. Garcia, and C. Roumestand (2013) Structural, energetic and dynamic response of the native state ensemble to cavity-creating mutations Proteins: Struct. Funct. Bioinf. 81:1069-1080. J. Roche, J. A. Caro, J. A., Norberto, D. R., Barthe, P., Roumestand, C., Schlessman, J. L., Garcia, A. E., B. García-Moreno E., & C. A. Royer (2012) Cavities determine the pressure unfolding of proteins Proc. Natl. Acad. Sci. USA 109: 6945-6950.